It's easy to cancel your Costco membership. But how many people actually do it? Compared to most memberships, it's ridiculously easy to back out of a Costco (NASDAQ:COST) subscription. The warehouse giant's cancellation policy practically dares its 42 million members to take the leap: "We will refund your membership fee in full at any time if you are dissatisfied," the company says. No cancellation fee. No prorated refund. No limited trial-window period. Costco simply offers complete refunds at any time, to any shopper who isn't happy with his or her membership. Good luck securing similar terms at your gym, cable company, or cell phone service provider. Yet hardly anyone takes Costco up on its generous cancelation offer. A whopping 91% of subscribers renewed their memberships last year. And the retailer has even managed to book an improvement in that stellar renewal rate in each of its last five fiscal years. The main driver behind those gains is shopper satisfaction, which we know has been rising lately. Costco just topped all specialty retailers in a survey conducted by the American National Satisfaction Index. Its score of 84 out of 100 not only beat other wholesale giants like Wal-Mart's Sam's Club, but it also left popular stores such as Barnes & Noble and Home Depot in the dust. Its just as impressive that Costco's satisfaction didn't slip in 2014, given that most grocery retailers suffered falling satisfaction as food cost inflation forced them to raise prices. Instead, Costco's simple business approach -- providing unbeatable values on a small selection of products -- continued to resonate with shoppers. The membership renewal rate is the single most important metric on the health of Costco's business -- even over the comparable-store sales figure that most retailers live and die by. Yes, comps growth is important. And Costco has been doing well in that area, posting a 7% gain over the last six months. By comparison, Sam's Club has been averaging just a 1% improvement lately. That's because Costco makes roughly zero profits on the products it sells after operating expenses. Despite booking over $110 billion in sales last year, the company earned just $12 billion in gross profit. 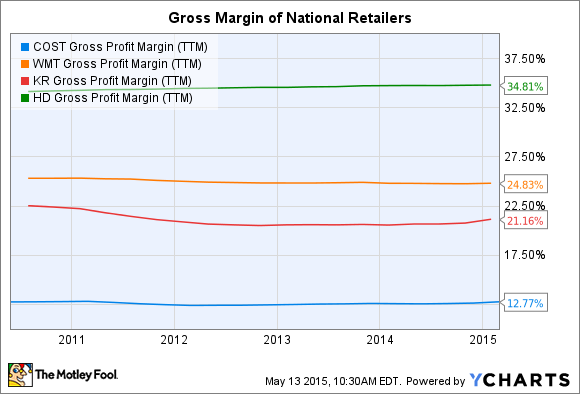 The resulting margin places Costco at the bottom of the list of national retailers, including Wal-Mart, Kroger, and Home Depot. But you can't get a complete picture of the business without including Costco's membership fees. Those totaled nearly $2.5 billion last year, up from $1.7 billion in 2009. And it's those fees that make up the majority of Costco's earnings. They averaged 75% of operating profit in each of the last three fiscal years. That statistic drives home the fact that Costco isn't so much a retailer selling stuff as it is a club selling memberships. And that's why the happiness of its subscribers is so critical to the company. Without highly satisfied shoppers who enthusiastically pay their $55 yearly fee, Costco's business model falls apart. And that would be true, sooner or later, even if the company made members jump through significant hoops to cancel their annual subscriptions.